The UN General Assembly passed a resolution condemning human rights violations in Syria and calling for President Bashar al-Assad to stand down by an overwhelming majority of 137 votes in favor, 12 against and 17 abstentions. Three countries said their votes failed to register on the electronic board. It’s striking to note that aside from Syria and Iran, no other Middle East country voted no. Zimbabwe was also the only African country to vote against. The other nine countries casting a negative vote were Belarus, Bolivia, China, Cuba, Ecuador, Nicaragua, North Korea, Russia and Venezuela. 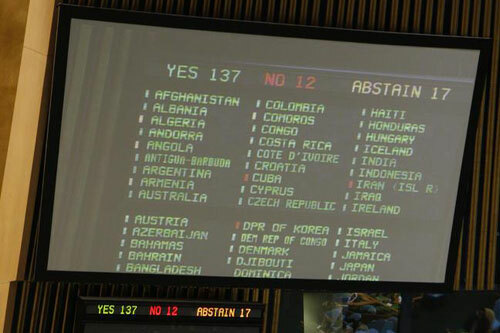 Only two Arab countries abstained: Algeria and Lebanon. The other 15 abstentions were cast by Angola, Armenia, Fiji, Cameroon, Comoros, Myanmar, Namibia, Nepal, Sri Lanka, St. Vincent, Suriname, Tanzania, Tuvalu, Uganda and Vietnam.